Is this really new news? I don't think so. There have been studies like this before showing obscene levels of sodium in most restaurant meals. We don't need a study to show us this, since most restaurants post their sodium levels for all to see (and ignore). If nearly all restaurant meals in nearly all restaurants have unhealthy levels of sodium; why is this accepted? Why are we all so willing to accept and rejoice in eating unhealthy food? Restauranteurs and customers alike appear to have little concern for health. Am I going too far with a statement like that? Maybe, but I can't help but coming to that conclusion. A new study (1) published in the Canadian Journal of Public Health revealed that the average meal in a sit down restaurant contains 1455mg of sodium, just shy of the adult recommended intake of 1500mg/ day. It gets worse. 40% of restaurant items had more than 1500mg of sodium, and 22% of items like stir fry, sandwiches/ wraps, ribs, and pasta entrees exceeded the upper tolerable limit of 2300mg/ day. Kids meals were equally offensive with over half the amount of sodium a child needs for the day in one meal. High sodium levels lead to high blood pressure and cardiovascular disease. While some people are less sodium sensitive, meaning dietary sodium affects their blood pressure less, this isn't the case for most people, so the risk isn't worth it. "Whoops! I gave myself high blood pressure hoping sodium didn't affect me much." Adding a few dashes of salt to that meal you ordered? It already has ginormous amounts in it. Every 3 shakes of the salt shaker adds another 120mg of sodium. Hello high blood pressure! What's up with that? Why put more salt "to taste" if there is already between 37-75 shakes worth of salt on the food already? One shake = 40mg sodium. The reason is over time the tongue and brain adapt to the flavour of sodium and in order to experience reward from sodium, you need more. Can you see yourself shaking a salt shaker 75 times over a plate of food (about 35 seconds of non-stop salt assaulting)? Most people will see that as being a bit excessive, even if they love salt, but this is the amount of salt that is in many restaurant meals. Of course restaurant industry reps are refuting the study results with lame claims that restaurants are doing their best to supply customers with what they want. I don't buy it. Literally. I very rarely go to many popular restaurants because the food is so demonstrably unhealthy that it isn't worth it. It isn't worth it monetarily because I'm paying for an inferior product, and it isn't worth it health wise. I'm approaching age 50 and I don't want to be another overweight, high blood pressure, high cholesterol statistic. I'm certainly not going to support a business that is openly willing to sell me poor quality food that negatively affects my health. A reasonable piece of cake isn't going to harm anyone but when almost everything on the menu is obesogenic and far in excess of healthy levels of sodium, the only choices are between unhealthy items. You can have any meal you want, as long as it's unhealthy. Thanks for being so conscientious. To be fair healthy dishes are starting to become slightly more popular, but it took huge pressure from health experts, special interest groups, the threat of government intervention, and customer demands. Most restauranteurs are not making changes because of an altruistic concern for their customers health. Nevertheless, I hope the tiny trend expands. Everyone wins with healthy eating. Restaurants still make money because they still sell food, and people are healthier. Kudos' to restaurants that specialize in healthy foods and to those making room for healthier menu items. A report from the Hudson Institute shows that "quick-service and sit-down restaurant chains that grew their lower-calorie servings delivered better business results." About 7 years ago I convinced a few restaurant owners to allow me to do a nutritional analyses of some of their more popular meals. A turkey sandwich measured out to have about 500 calories, which is a good total for a meal. For this restaurant, this sandwich was one of their best sellers. Another restaurant had very high calorie meals. Out of 3 plates that I analysed each were over 1000 calories. The owner was a bit surprised this, assuming the meals were of much lower caloric value. The idea of me doing the analyses was to be able showcase some 'light' meals on menus. There weren't any light meals. I made some suggestions on how they could serve the same or similar menu items, but smaller servings, and less fat. They weren't interested in this as they were certain the lighter meals would not sell. I told them there are enough people looking for light meals that the menu items would sell, and further more that some restaurants are starting to sell lighter plates, so why not give it a try. They didn't. Another restaurant that I had closer ties to, being a daily visitor to, agreed to make a pasta meal to my exact standards. This was great! I provided a recipe with the exact amounts of ingredients that made for a 500 calorie plate of pasta with chicken in a marinara sauce with veggies. Soon other customers were asking what I had ordered. I explained it was a meal that met my expectations of a healthy meal. Customers were sold. If it was good enough for Cris the trainer, it was good enough for them. The pasta plate took on the moniker, The Trainer Special. It became a favorite of many customers. One evening I developed a pain in my side so acute I thought I had apendicitis or something very wrong. It was exceedingly painful to move or breath deeply. I called a cab and got myself to the emergency. The doc's told me I have symptoms that suggest appendicitis, and ordered X-Rays. I was put on morphine for the pain. The X-Rays came back. "You see all this darker area in here? ", the doctor said, pointing to a section of my abdominal X-Ray that looked like where my intestines were. "Yes, I see it". "Mr. LaBossiere, you are severely constipated." After a short pause I replied, "so you're saying I'm full of crap". I chuckled a little. The doctor was like a piece of stone. Not even a slight response. Tough room. After a bit of serious doctor talk about my treatment, the doctor lectured me on good nutrition. "Doctor my nutrition is described as perfect, by my sports medicine doctor. I'm not dehydrated and I get plenty of fibre." I gave a detailed recollection of what I eat. The doctors were perplexed. They started thinking I may have something else wrong, because my diet in no way should cause constipation that puts me in the hospital. Then one doctor asked, "have you been eating anywhere else lately, a new restaurant?" Bingo. A fitness club I belonged to at the time, had a restaurant. I had taken to eating at this restaurant near daily for one of my meals. I hadn't given it any thought though. I explained what I was eating there for lunch or dinner and the doctors said compared to what I was used to, the restaurant meals were too high in fat and too low in fibre. I had switched to this food too quickly and my digestive system wasn't keeping up. "Don't eat at that restaurant anymore". That's an endorsement no restaurant needs; don't eat here, doctors warn it may cause hospitalizing constipation.. I spoke with the club manager about my experience and how I could never eat there again. He asked me not to tell any of the members and that he would review the menu right away and added he would instruct the chef to make me whatever I wanted, however I wanted it made. Thus the birth of The Trainer Special. Eventually I could no longer eat my venerable Trainer Special as the chef kept sneaking in extra fat and filling the entire plate which made the meal over 1000 calories. I tried explaining the purpose of the menue item, it's the TRAINER special, because it's designed to be healthy. People who order this are expecting it to be low calorie and healthy. The chef couldn't get their head around that and thought the plate had to be as full as possible and have more fat flavour in order to be worthwhile. The rest of the menu hadn't changed too much and I stopped eating there all together. The Trainer Special was taken off the menu. They took a well selling item off the menu. They were making money off it. Had these restaurants had the sense that restaurants studied in the Hudson Institute report do, they would have measured a growth in sales enjoyed by forward thinking businesses. 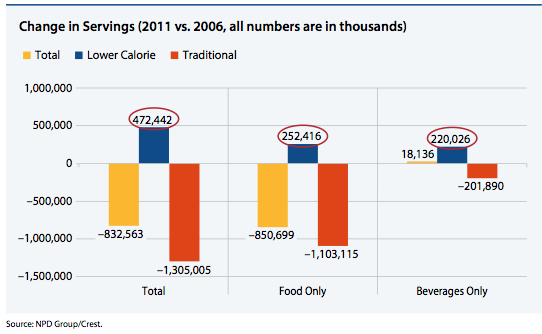 Comparing 2011 to 2006, 2011 low calorie items was a growing source of sales where over the same time period traditional high calorie foods did not have the rate of growth, indeed some of the high calorie items shrunk in sales. Low calorie items were around 500 calories and restaurants studied included MacDonald's, IHOP, Burger King, Olive Garden, and other restaurants that are perhaps better known for their hyper-caloric obesogenic meals. The study didn't look at nutrient quality. Most of the meals were simply smallar versons of their typical high-fat high-sodium meals. It's a step in the right direction though. I've been saying it for years; lower calorie meals will of course be profitable, if not more profitable. The tides have to change and I think it's starting. Looking forward to that 1000 calorie plus meal because it tastes sooo gooood? Forgetaboutit. Nothing good can come of it. It's just overeating, and what good is that? If you're in the restaurant business and have been thinking about lower calorie menu items, go for it, it will improve your bottom line. Oh.. and for those who know about my aversion to eating at restaurants.. now you know why..